Adore your top! Those wedges are gorgeous! Love that top and those Tory Burch wedges are to die for! I absolutely love this top! Perfect colors for Spring and Summer && Your Kate Spade watch just melts my heart! Your hair is so pretty styled that way. love the top too. in LOVE with those shoes!! This is a perfect fun spring look. Fantastic top and necklace! You look lovely! I love the bright neon yellow, but never know how to wear it, lol. The flower detail is so pretty though, without being overwhelming! Gorgeous! you look beautiful Jade! love this casual chic look! I discovered your blog recently and find myself pinning every look! Would you consider doing a post on things you do to look so pulled together everyday? I'm a fan! Love the neon floral blouse, looks so cute with the navy wedges! I love that top! The color just screams spring! I love your blog! I've been eyeing those tory wedges. Are they comfortable? I have semi wide feet and am not sure if they look wide enough, thanks!! 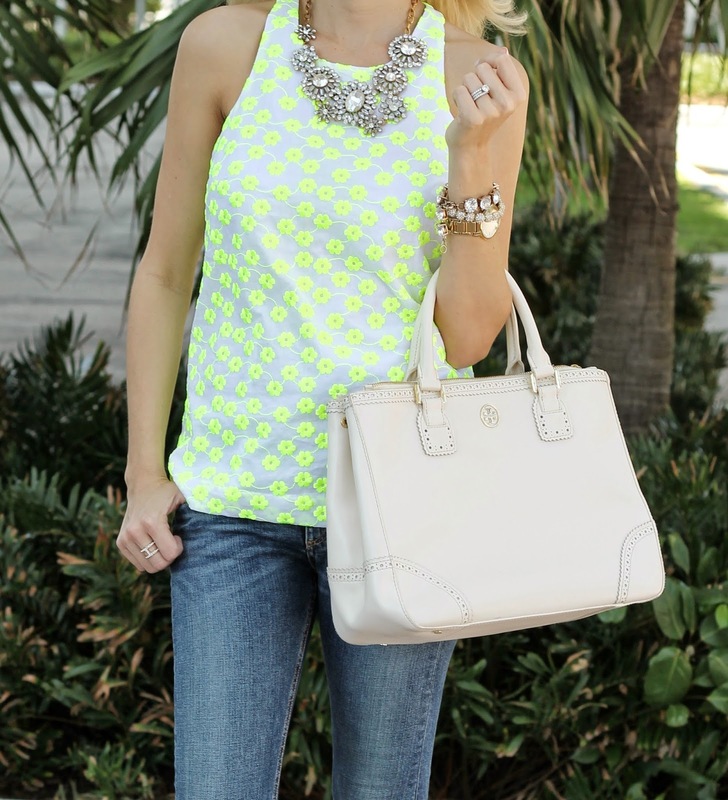 This neon is so chic on you. Brilliant without being overpowering. Adore it.